This article was originally published in the We Are: 2013 magazine and has been republished in the wake of the news of Wally Triplett's passing. Wally Triplett, an 87-year-old Detroit resident, doesn’t think of himself as anything special. Despite being the first African-American to be drafted and play in the NFL, and one of the first African-American players to play for Penn State, he just sees it as a lot of good luck. “Luck of life,” he calls it, occasionally referring to it as “L.O.L”—although even at his age, he has an acute sense that the acronym has a much different meaning to everyone else. Despite his humble nature, Triplett spent much of his life breaking down barriers, carrying with him an undeniable mantle of one of sports great pioneers. Wally remembers stepping on to the field against the Green Bay Packers, the only African-American on the Lions’ roster, with a simple fence separating him from the torrent of jeers raining down from the Lambeau Field stands. It was a far cry from the demeanor of fans and the vast diversity of today's teams. Talking to Wally is like stepping into a time machine. Born in 1926, he lived through the rise and modernization, both economically and culturally, of America. High school history classes skim over decades of change and culture that he saw with his own two eyes. And he knows it. There is a sense of excitement in his voice as he picks up the phone on the second ring. His incoming phone calls show up on his TV screen so he doesn’t miss them. It’s an opportunity to share his story, and perhaps a chance to remind a younger generation that things haven’t always been like they are today. And he’s right, I don’t. Born and raised in the affluent north Philadelphia suburb, Triplett was a talented football player with a fortunate address. His surroundings led the University of Miami to offer him a scholarship in 1945 -- under the false assumption that he was white. When word got back to Miami that their latest football prospect was, to their surprise, black, they, as politely as you can in these situations, rescinded the scholarship. Eventually Triplett ended up at Penn State in the fall of 1945, earning a Senatorial Scholarship through his academics, although initially finding campus was a bit of a struggle. That Coach Higgins was Bob Higgins, a Corning, New York, native and former alumnus of Penn State. A man with a stern face was the product of his New York roots that saw Corning turn from lumber production in the late 1890s to one of the world’s premier glass manufacturing cities. Much like Triplett, Higgins had seen plenty of changes over the years. By 1945, Higgins had been coaching at Penn State for 15 years; coaching for just three more following Triplett’s arrival at Penn State. But a decision Higgins made that year was one that very may have changed the course of Triplett’s life. 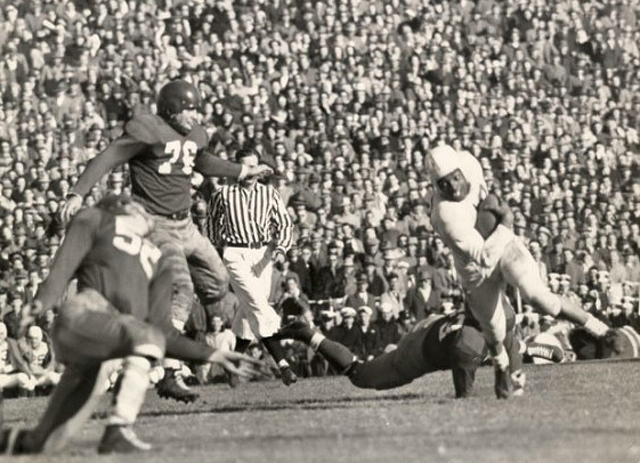 And quietly, just like that, Wally Triplett was the first African-American to play varsity football for Penn State. From there Wally’s story at Penn State is one known by many Nittany Lion fans. In 1946, Penn State was to end its season at the University of Miami, the school that had just taken away Triplett’s scholarship offer because of his skin color. Because the school was segregated, Penn State was asked to travel without its then-two black players: Triplett and returning serviceman Dennie Hoggard. By 1947, Penn State had rounded out into one of the nation’s best teams. Victories over the likes of Fordham, a team that would see Vince Lombardi take the helm a year later, and Syracuse gave the Nittany Lions an early-season 4-0 record. Penn State would roll over their next five opponents, outscoring them 123-21 en route to a Januray 1st meeting against a Doak Walker- led SMU team in the 1948 Cotton Bowl. As the minute dragged on it seemed that the conversation was coming to an end. Wally sounded tired, as most soon-to-be 87-year old men do a half-hour into a conversation. I had planned to talk to him about his time in the NFL and his Penn State back- ground, but didn’t want to force the issue. Just in passing, as if all three of us had been lifelong friends, Wally breaks a brief silence with an unexpected statement. “I used to play Pinochle with Jackie,” Wally said. “Oh yeah, Jackie Robinson knew me from this kid Joe Tepsic from Penn State,” Wally said. Just a casually name-dropping Jackie Robinson? Ok, we aren’t yet finished here. Wally and Robinson would go on to have a causal relationship when Triplett would visit Tepsic whenever the Dodgers came to Philadelphia. Games of pinochle and warm meals at Mom’s in Philadelphia were common until Triplett was drafted by the Detroit Lions in 1949. The 1949 draft marked another historic moment in Wally’s life. He was not the first African-American to play in the NFL, but the third to be drafted and the first to ever actually play on an NFL team. In the NFL, Wally would be the only black player on his team. Trips outside of Detroit would mark some of the harshest racial moments in Wally’s professional career. Fences were all that kept well-lubricated and overly vocal crowds from giving Wally a real piece of their mind. The locker room was friendlier, but the sense of belonging always lacked for Wally as he transitioned from a galvanized Penn State program to the harsh realities of big city life and an unfriendly world. During his first year and a half in Detroit, Triplett lived in a housing district called Black Bottom. A predominately black neighborhood in that was demolished and replaced with Lafayette Park in the 1960s, the Black Bottom area on the city’s east side became known for its contribution to American music, including Blues, Big Band, and Jazz from the 1930s to the 1950s. F. Scott Fitzgerald would have felt well at home there writing The Great Gatsby as all-night parties electrified an otherwise empty night. “Joe used to pick up the tab for us at the table,” Wally said casually dropping names again. This time he was referring to boxer Joe Lewis. “It was the celebrity table at one of the prominent hotels called the Gotham Hotel. It was the headquarters for the numbers business. That’s where a lot of the stars lived in and around that area. Joe was always there because he had a room there. “My first year there I lived on the same street as Joe’s manager, and he ran a speakeasy and turned that street into a real popular street later on. When the bands came through you would have to pay big money to see them, Bing Crosby, the Dorsey Brothers, they were called the Black and Tans and they ran all night. Those acts would play in the legitimate venues until two or so in the morning and then come play at the speakeasy until maybe seven in the morning. “They’re still looking for Jimmy Hoffa, I remember seeing him at the Gotham Hotel. The road number 75 that runs by here now and nobody wants to dig that up to find him. I ended up working at one of the local racetracks and it just so happened that it was owned and operated by the lo- cal mafia,” he said. “When they heard that, they hired a clerk, and I was hustling everything at the time, a sportswriter told me to go and try and get a job at the racetrack andIdid.But in doing so I had to have a meeting with some of the top members. Out of that I got a lot of respect for those guys because they said there wasn’t going to be any discrimination at that track and they were passionate about that. And then his voice trails off. He now lives with his wife, whom he reminds jokingly that they’re taking it day-by-day. Their home is located in an area that was once restricted for blacks, an irony not lost on Wally as he recalls how the previous owner built the house by hand and sold it to him, a work-around for the day’s restrictive covenants that prevented African-American’s from living and working in certain areas of the city. Now there is only living, something Triplett seems to acknowledge will only go on for so long. He isn’t eager to claim a lot of responsibility for where his life has placed him in history, accepting it more as a fact people have ascribed to him than anything else. But it’s undeniably true that Wally Triplett’s life helped pave the way for young talented African-American athletes to get their fair shake at college athletics. 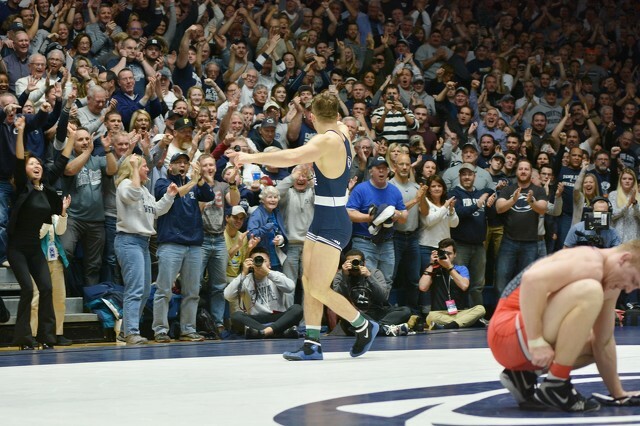 Moving on, Triplett wants to make it down to State College for the Michigan game but there is an unspoken recognition of his age. As the conversation winds down Wally signs off with a quote that seems to summarize his triumph through all of his trials and tribulations all too well. “If the Lord is willing and the creek don’t rise, I’ll be here by and by,” he said. He hangs up the phone, and my ride on the time machine comes to an end.